A modern take on the precious, whistling automaton. While not as widely collected today as they were in the 1990s (the late Lord Sandberg of HSBC collected them, amongst other things) singing bird boxes are amongst the most precious mechanical objects ever made. Top quality examples regularly sell for six figures at auction, and the all-time record was set in 2011 when a pair of Freres Rochat singing bird pistols – yes, chirping birds that pop out of a bejewelled gun – sold for US$5.8m. So MB&F, the watchmaker that takes inspiration from 19th century watchmaking for its Legacy Machines, is perhaps an apt creator for the modern day singing bird box. It’s worth pointing out that beyond watches and clocks, the brand has created mechanical audio since 2013 with the Music Machines, music boxes shaped like spacecraft. 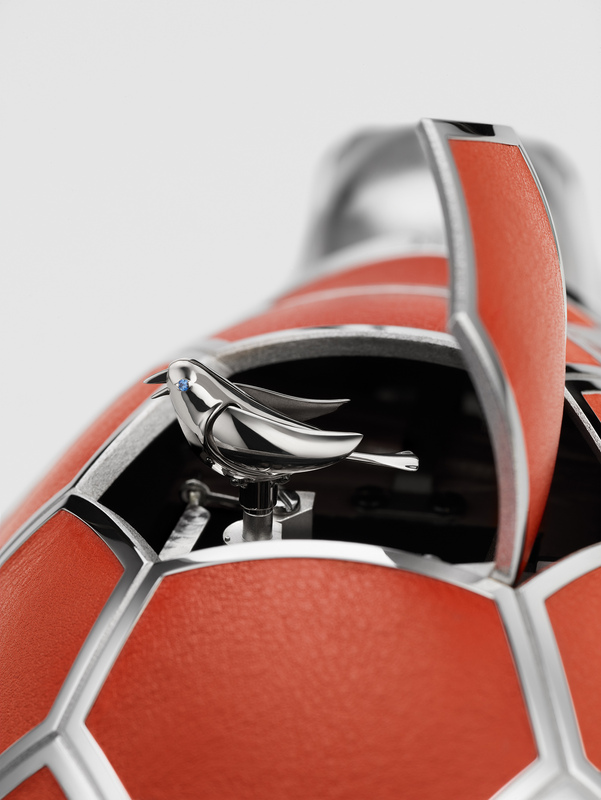 MB&F’s take on the singing bird box is Kelys & Chirp, a tiny bird hidden inside the shell of a tortoise. The automaton is the result of a three-way collaboration between music box specialist Reuge and automata specialist Nicolas Court. 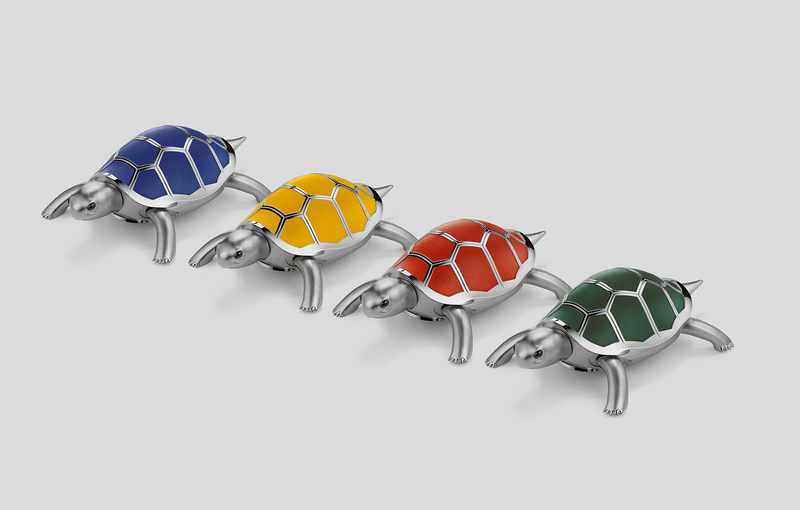 Kelys, derived from the Greek chelys for tortoise, is made of rhodium-plated brass with 12 leather inlays on its shell and black onyx for its eyes. The tortoise “walks” at a leisurely pace – actually propelled by rollers on its base – with its head bobbing from side to side. A hinged lid on the top of the shell pops open to reveal the singing bird, which rises up flapping its wings while moving its tail and beak to the bird song, a mechanical dance that lasts 10 to 12 seconds. Measuring 24cm long and 16cm wide, with a shell that’s 8cm high, the automaton weighs 1.4kg and consists of 480 components. 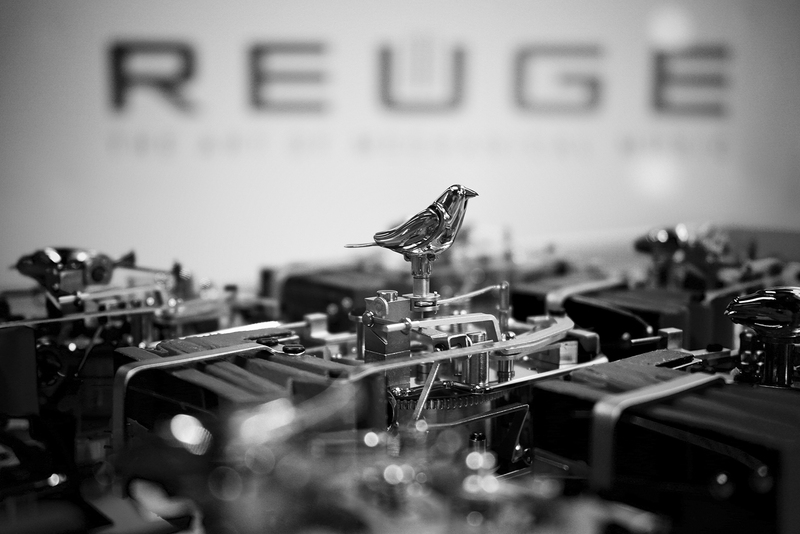 Made of 18k white gold with sapphire eyes, the singing bird relies on a double bellows system to move. 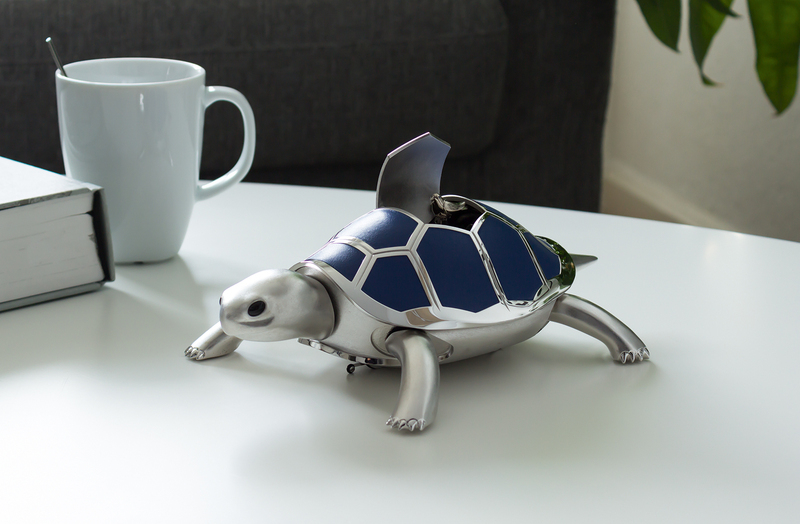 That in turn is powered by a movement which also powers the turtle automaton. 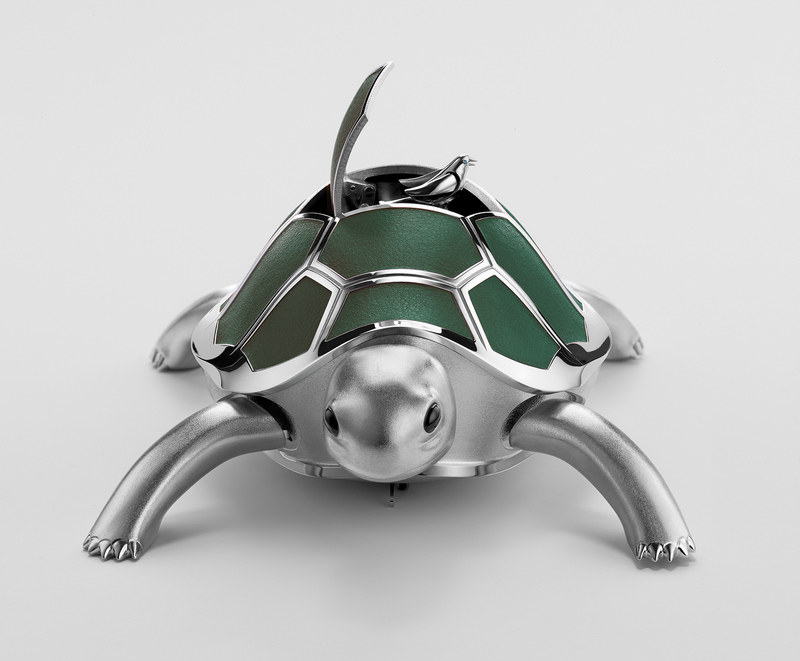 The movement offers a power reserve of three cycles of animation (meaning the turtle walking and bird singing simultaneously) when fully wound, with the circular winding key located on the belly of the tortoise. To move the entire turtle with a single mainspring in the singing bird movement, the team had to find the optimal low ratio gearing. In addition, elliptical gearing and cams had to be used to replicate the intermittent gait of the infamously slow animal. The turtle moves at an average speed of 0.06mph, in sync with the bird’s movements and singing. And additionally, a “friction clutch security system” is integrated into the automaton mechanism to detect discontinuities on surfaces and stops the turtle from rolling over the edge of a table. Also, if the bird is pushed back into the shell down while singing, a security lever system slowly pivots it back down. Kelys & Chirp is a limited edition of 18 pieces each in blue, green, yellow or ochre, and is priced at SFr49,000. The big line-up for a big birthday, illustrated by original photos. 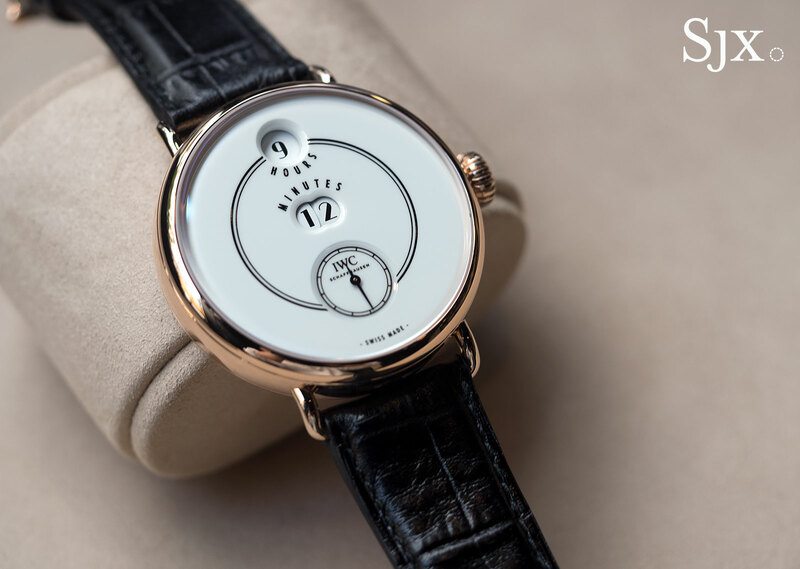 The last time IWC celebrated an anniversary was in 1993 it did so with a fairly compact collection, essentially the Il Destriero Scafusia uber-complication and the Portugieser Jubilee trio. 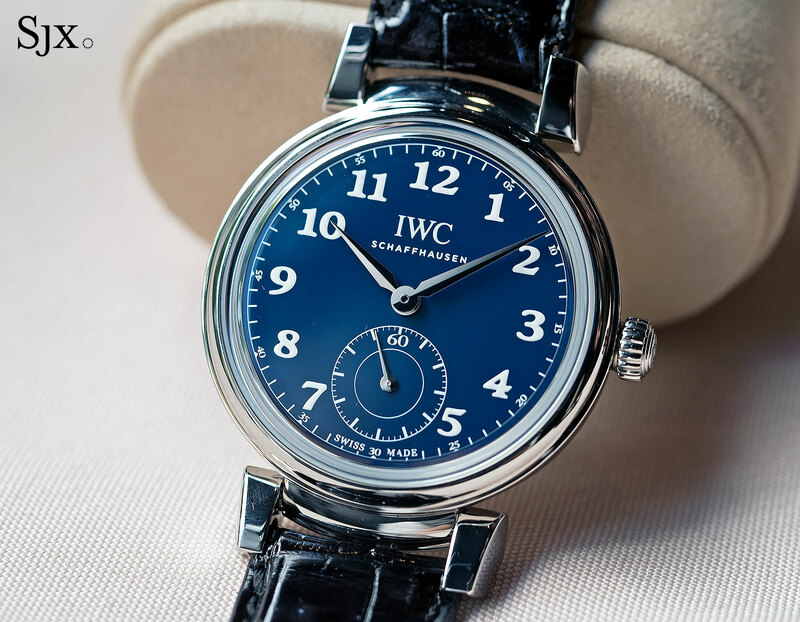 Twenty five years on IWC’s revenue is perhaps 25 times larger than it was in 1993, and the 150th anniversary line-up is correspondingly larger. The full range will be unveiled at SIHH 2018 in just over a month’s time, in the meantime IWC has taken the covers off five watches, including the best of the lot, the Tribute to Pallweber Edition “150 Years”. Made up of 27 models, the 150th Anniversary Jubilee Collection has something for every taste and budget – the simplest model will start under US$5000. 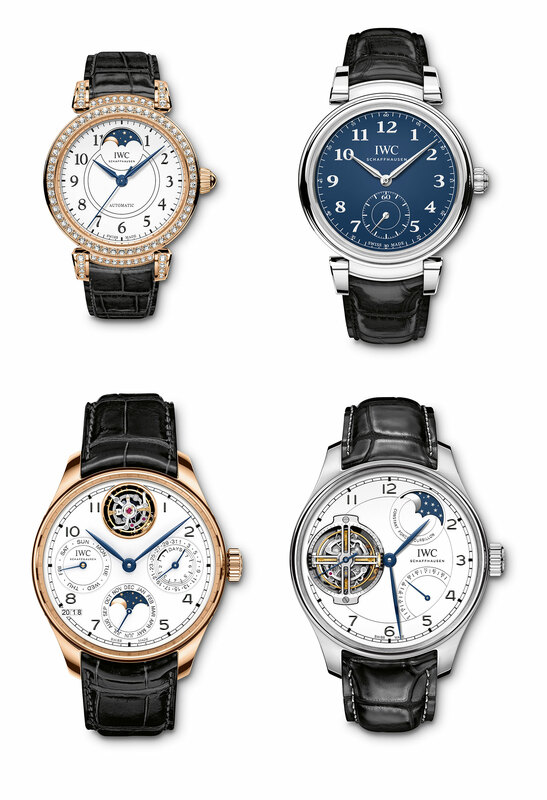 It includes variants of watches from all of IWC’s bestselling model lines – Portugieser, Portofino, Pilot’s Watches and Da Vinci. 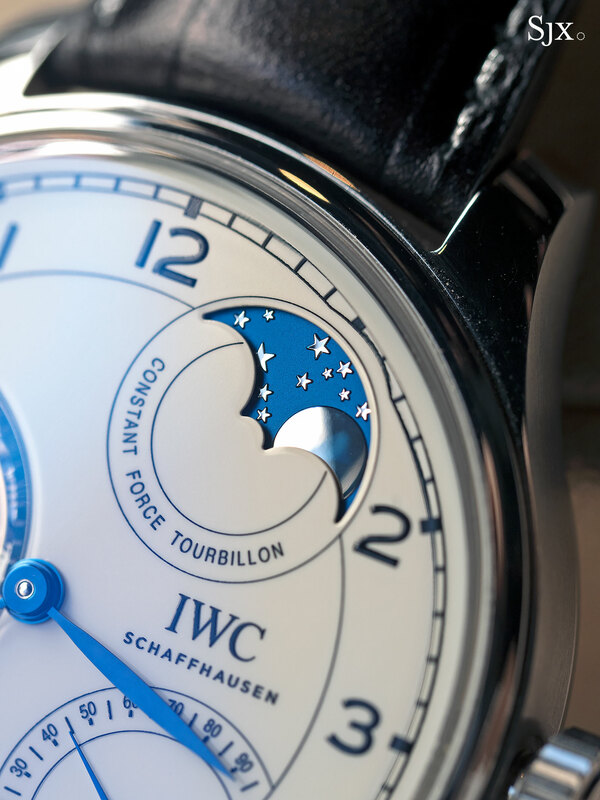 If you know which are IWC’s most popular models, chances are you’ll know what’ll make its debut in anniversary livery. While the offerings are diverse, all are united by several common details. The most obvious are the dials, which will either be white or deep blue glossy lacquer, meant to evoke the look of fired enamel. And the other is an anniversary medallion inlaid on the back or movement. The top of the line anniversary watch is the Portugieser Constant-Force Tourbillon Edition “150 Years” in red gold (ref. IW590202). Based on a model already in the catalogue, this boasts a tourbillon with integrated constant force mechanism, as well as a power reserve display and moon phase. 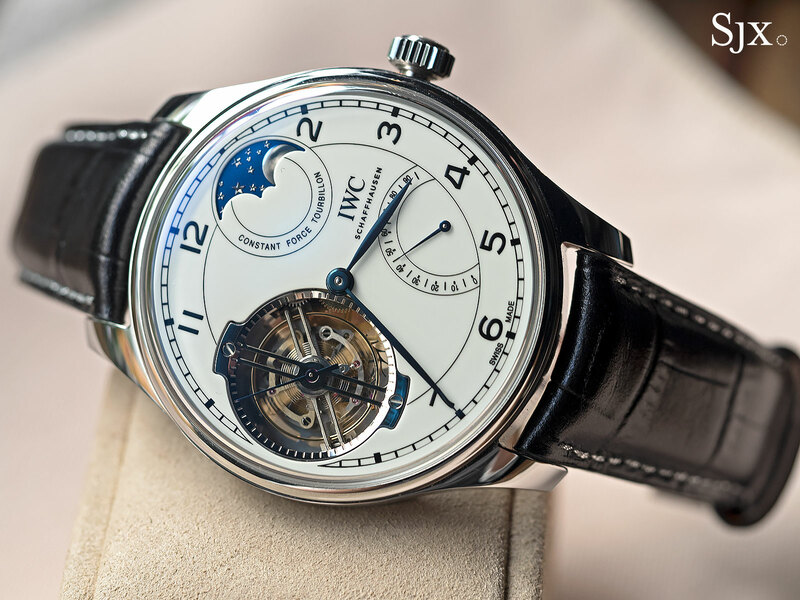 And it’s third IWC wristwatch to feature a silicon pallet fork and escape wheel, after the Da Vinci Tourbillon Retrograde Chronograph and Portofino Hand-Wound Tourbillon. 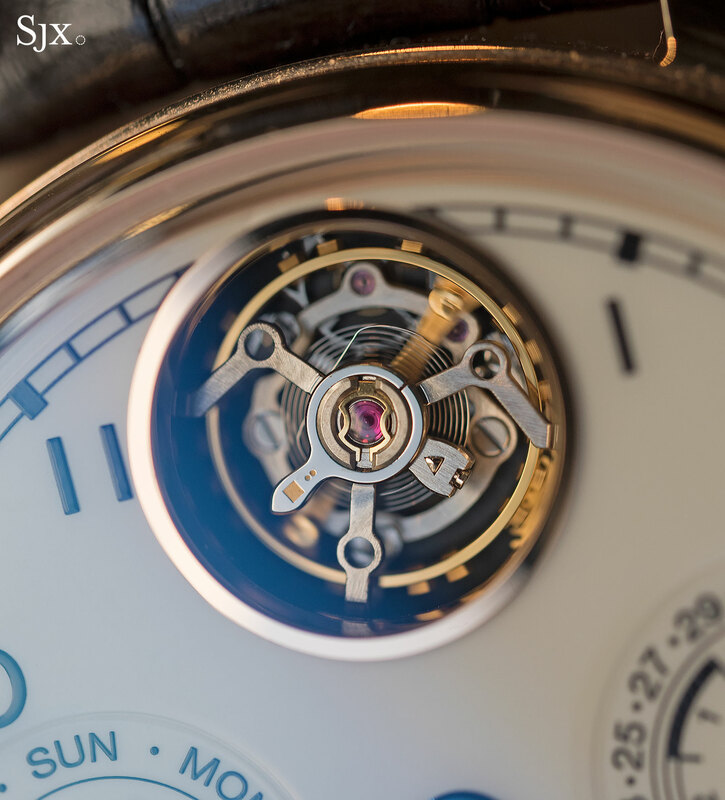 The constant force mechanism is unusual: the tourbillon cage moves in one-seconds steps for the first 48 hours of the 96-hour power reserve (which is four days), after while it rotates like a conventional tourbillon. That’s a consequence of the constant force mechanism, centred on a small spring that is wound up and released every second. 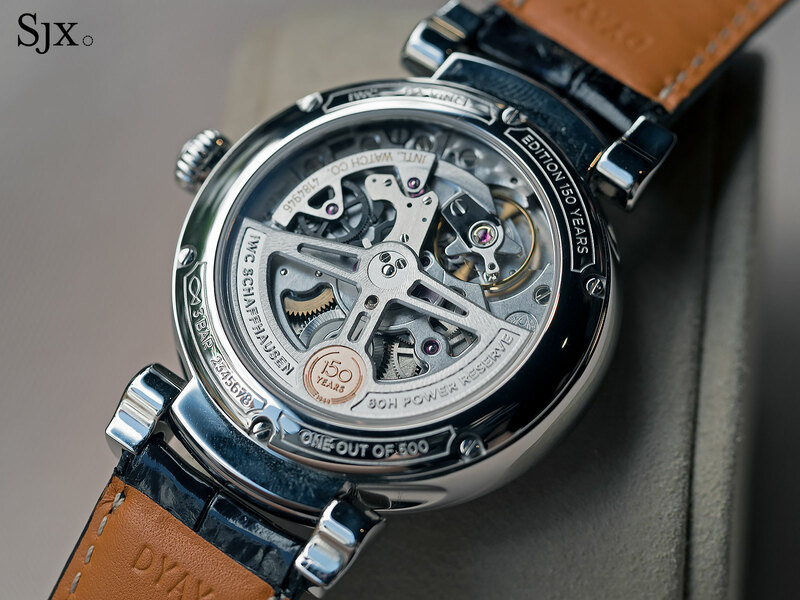 After the first 48 hours of power reserve the torque from the barrel is insufficient for the constant force mechanism to work optimally, hence its automatic disengagement. Notably, the moon phase display is especially accurate, varying by only a day after 577.5 years, as opposed to the 122.5 years of the typical moon phase. This is in platinum and 45mm in diameter, and limited to 15 watches with a white lacquer dial. It will also be available in blue. They will be priced at approximately SFr255,000 and reach stores in April 2018. 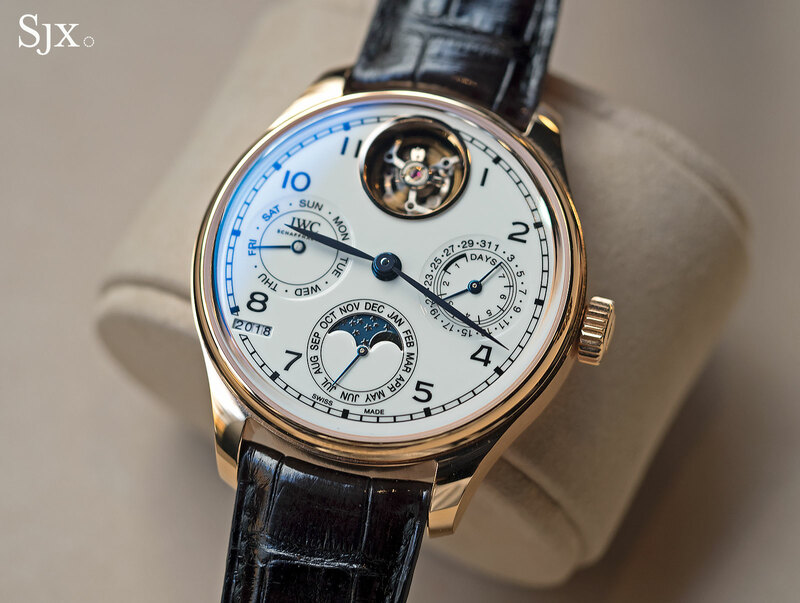 One step down the price chart is the Portugieser Perpetual Calendar Tourbillon Edition “150 Years” (ref. IW504501). Available only in red gold with a white dial, it’s a limited edition of 50 pieces powered by a newly developed movement, the cal. 51950. 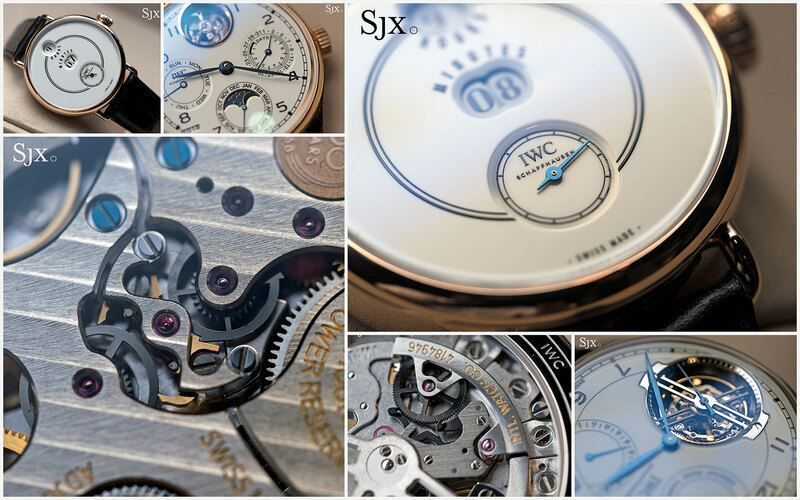 The movement is based on the original IWC seven-day automatic, the cals. 5000, 5001 and 5011 (and not the second generation cal. 52000). 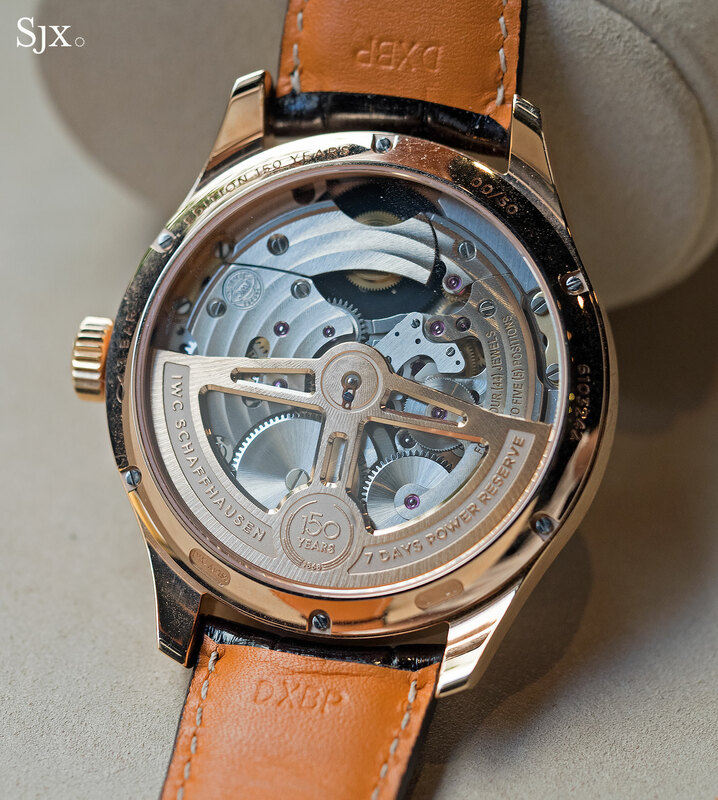 It’s essentially the automatic base calibre with the addition of a flying tourbillon at 12 o’clock, made possible by the fact that IWC first developed a small tourbillon for the Il Destriero Scafusia of 1993, as the tourbillon regulator had to be retrofitted to a Valjoux 7750 base. Because the movement also has a perpetual calendar module on top, the tourbillon sits relatively deep inside the porthole at noon. The case is 45mm in diameter, and the price is expected to be SFr110,000, with delivery starting April 2018. The Da Vinci Automatic Edition “150 Years” in steel with a blue dial (ref. 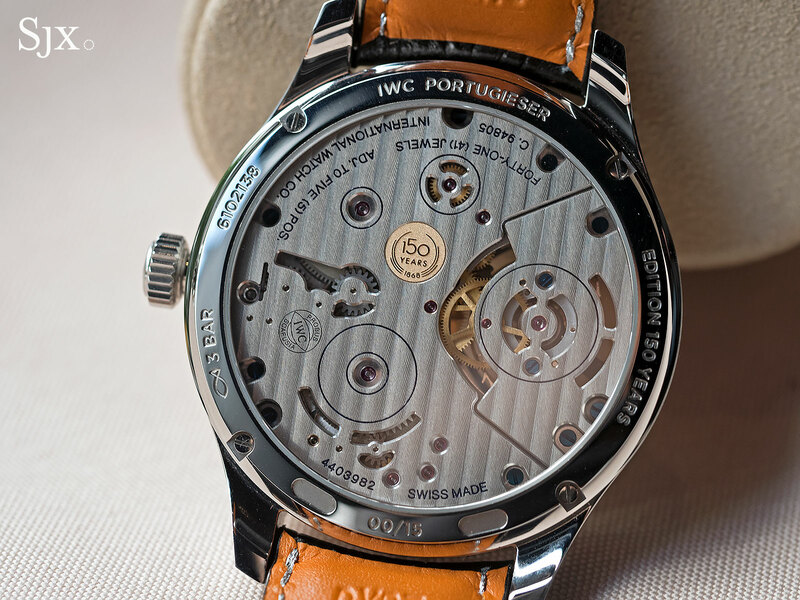 IW358102) will be the most affordable anniversary men’s watch with an in-house movement – there will be models equipped with outsourced calibres – priced at just SFr9900. Despite being more affordable, it is distinguished by the fact that it’s one of the few anniversary watches powered by a brand new movement, the cal. 82200. Conceived to be the mid-range in-house movement that’s small enough to fit in watch cases under 40mm in diameter, while being able to accommodate other complications. The cal. 82200 has a single barrel, 60-hour power reserve, as well as IWC’s proprietary Pellaton winding mechanism with the winding pawls and gear in wear-resistant black ceramic. 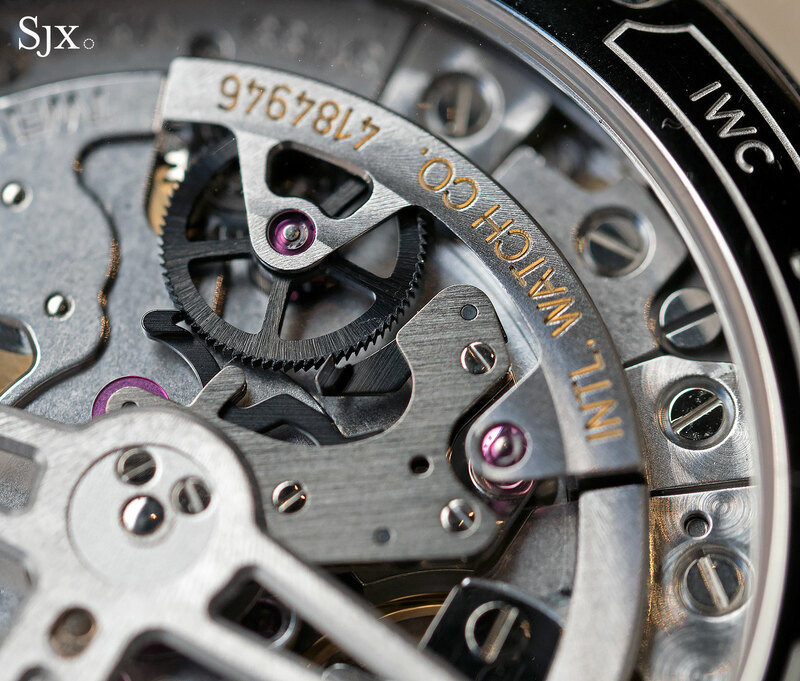 Expect to see more of this movement in future IWC watches. 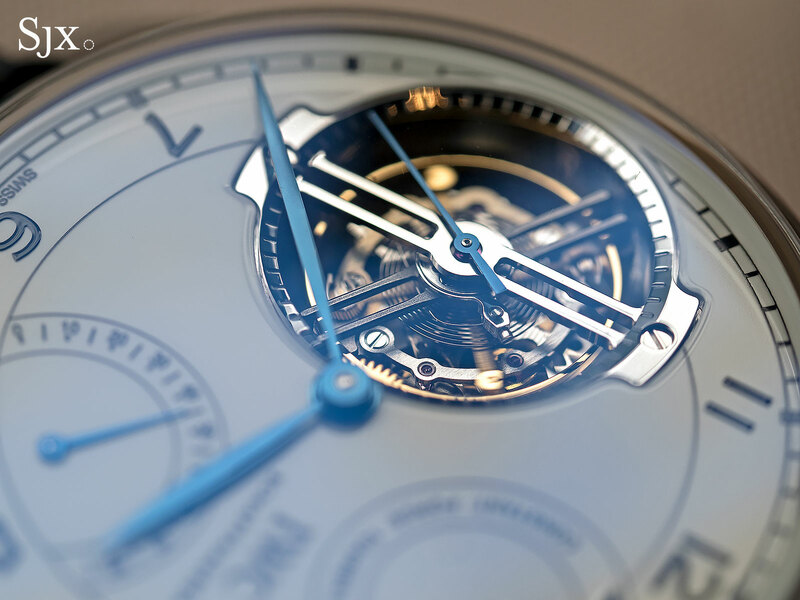 The Da Vinci is 40.4mm in diameter and stainless steel, matched with a blue lacquered dial. It’ll be limited to 500 pieces. A white lacquered model, as well as one in 18k red gold will also be available. 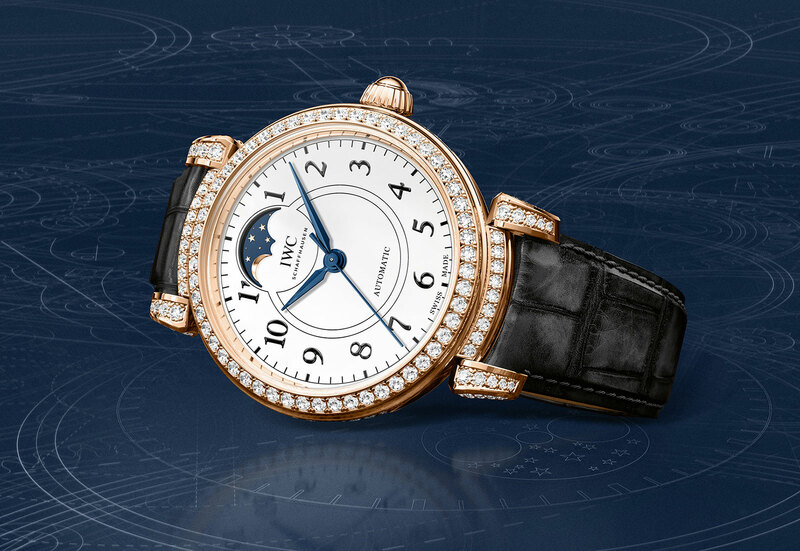 While the 150th Anniversary Jubilee Collection is predominantly men’s watches, it includes two watches for ladies. 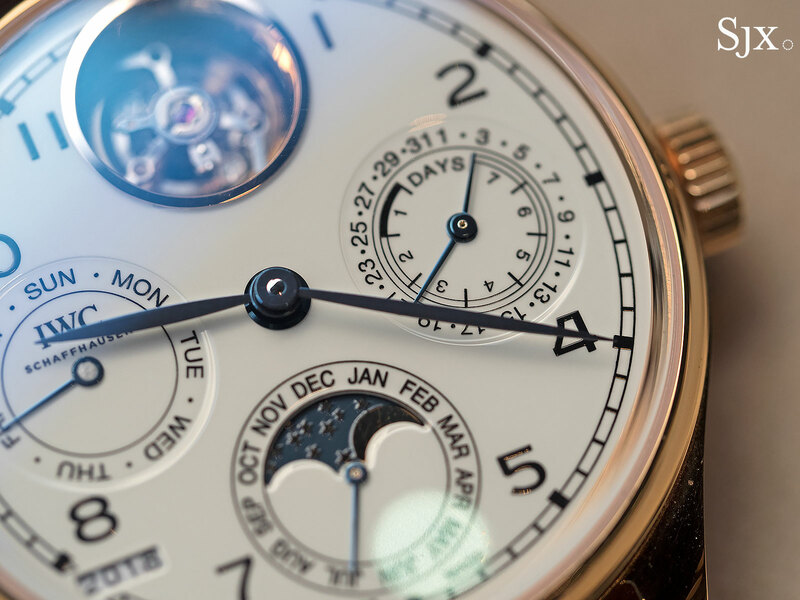 One is the Da Vinci Automatic Moon Phase 36 Edition “150 Years” in 18k red gold (ref. IW459304). This is a 36mm automatic, covered in 206 brilliant-cut diamonds on the bezel and lugs. It features a moon phase display at noon, and is powered by the cal. 35800, which is actually a Sellita SW300. It’s limited to 50 watches in red gold, priced at SFr31,000. Another variant of this model will be white gold. The rest of the collection will be revealed on Monday, January 15, 2018, as soon as SIHH 2018 opens its door. Stayed tuned for more.